When I enter the room as a white, middle-class teacher, able-bodied, straight teacher… I carry with me a lot of privilege. While I cannot give my own privilege away, I can acknowledge it, I can be an ally, and I can work through my own barriers to ensure that every student has a place in my classroom. Like Kohl suggests, a good teacher is one who empowers her students, not one who judges or shames them. I have taken many classes in the past where the topics the topic of oppression and power have been discussed, but many of these past discussions have remained academic and theoretical, not practical. I truly appreciate the many practical tools we learned about to incorporate multi-cultural education into our classroom. I can help students who do not usually talk in class gain confidence, by giving longer wait times, encouraging group discussions, teaching active listening skills, and doing reflections through sharing partners (dyads). I can help students gain common background knowledge by creating word-walls, doing pre-tests to evaluate knowledge, and differentiating instruction. I can help myself be the best teacher possible by continuing to learn about the students I’m teaching and about the cultures within our classrooms, communities and world. This year, I will have the opportunity to teach in an inter-disciplinary classroom teaching social studies and language arts. In the first semester my host teacher wants to look at the process of elections in the United States. Throughout this course, I have thought about how I can overcome my own personal challenge of teaching about “democracy” when I feel that so many people are failed by the system. I am really looking forward to creating a multi-cultural lesson on the elections by examining the tough questions of: Who is served by the US government? Who is included? Who is excluded? What does political engagement look like? And not just who has been elected, but who has been politically engaged in issues throughout history? I have thought a lot about how I always learned about white men in my social studies classes and how today, of course we have seen positive shifts to more inclusive representation in government, there are still many gaps that exist. I want to look not just at the history of the United States and how democracy functions as a whole, but look within our own state too. For instance: How do tribal organization come to decisions? What is the political purpose of large gatherings like Alaska Federation of Natives Convention? What impact do decisions made by the federal government have on our own state? I also want to teach students how they can be active participants in democracy in order to create change within their own communities. I am excited to take everything I have learned from this course to teach more dynamic, engaging and culturally relevant lessons for my students. Word Wall: There are a couple of words that I think we missed on our word wall, but all the words in bold are ones we worked to define together in class. Equity didn’t make it onto our word wall, but I think it should have. 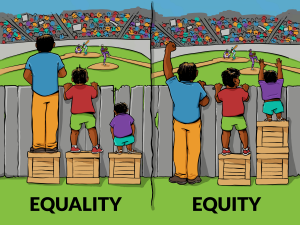 Whenever I think of equity, I think of this image. Creating an equitable classroom does not mean that we give the same instruction to each students… instead it means we differentiate our instruction to meet the needs of ALL our students. It means that each student should be given the tools and instruction they need to be successful. It means we compare our students less to one another, and challenge them individually instead. When we are teaching, we should present information differently for students with different learning styles, for students from different cultures, or for students with different sets of background knowledge. Transformation: Herbert Kohl wrote “teachers are transformers, that can help people transform their lives in decent ways and in that manner contribute to the transformation of society.” (I Won’t Learn From You, pg. 76) I really liked that we focused so much on the positive ways in which we can influence our students. We examined tough topics like inter-generational trauma, institutional racism, gaps and disparities… but at the end of each discussion I was always able to come back to hope. To me transformation is the ability to work backwards, to allow our students to shape our schools, to disrupt oppression, to build creative curriculum, and above all, to build positive relationships and learning environments for our students. This was an inspiring and informational piece, I loved it and it gave me confidence knowing that there will be educators such as yourself out there in the world showing students not only what to learn, but how to learn. You are always so well-spoken about your opinions. I want to say think you for doing so. Everything you have said has your ideals and positive concepts behind them. Your words are powerful and I am thankful that you are in this cohort. With that being said, This post, that I read in your voice, is powerful and takes pieces from the readings that we have done for the last few weeks. You recognize your privilege and have a desire to become an ally. It is important to remember that some people will avoid you because of the privilege that you have and it is your job to pursue those students, along with all students that need guidance, or even those that don’t. I also enjoy that each of your words from the word wall reflect this central message.